Many of you know I have a skincare business, that this is one of the ways I create an income for my family from home. At the beginning of the year the corporate office does some seriously awesome training sessions for us. They go over changes that will becoming and new tips on building our businesses. They do this through out the year as well, but the first one of each year is only second to the massive training during our convention in the Fall. Last week was our first week of training and the first speaker was a man who I had never heard before. His session was on changing your mindset. Focusing on what you’re going to accomplish and believing it. He called it “Flexing Your Faith Muscle”. Now, I will confess to you that I was just about to tune out on him. I can be a bit skeptical when people are (what I view as) “preachy” in their business. Some times it just comes across as a bit fake to me. I could be way off, but that’s just how it strikes me some times. I had been very interested in hearing this topic from the moment I read the list, so I continued on. He began talking about how you need to have faith that God is going to bless you and grow you where He wants to grow you. That you need to flex that faith muscle and know that you will accomplish great things with God by your side. I finished the training with this just burning in my thoughts. I woke up the next day wondering if I believed that God would bless me with the amazing business I want to grow. Will He bless me because I am faithful to Him? This stuck with me through out the day. The next day, while getting ready to start our school day, it struck me. I need to be strengthening my faith muscle in Him and allow Him to guide my path. 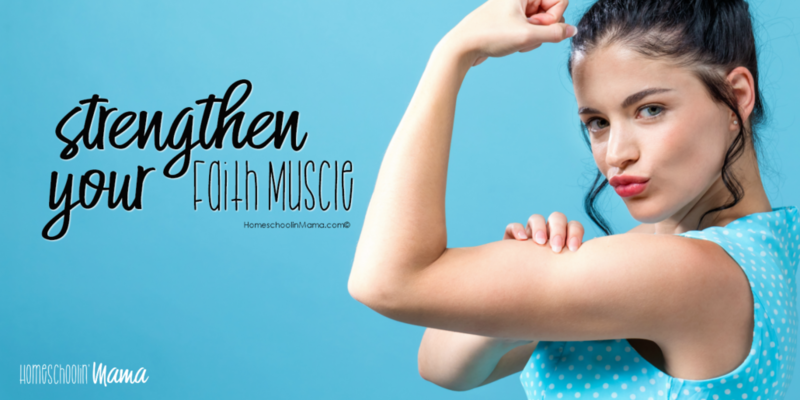 Let GOD flex His muscles (they are way larger than mine and more powerful). As we started our homeschool day I took it one step further. As a homeschool mom I need to strengthen my faith muscle that God has my children and our homeschool. He knows my desires to educate my children as they need me to do so for them. God knows everyone of my hopes and dreams for them. He also knows each of my daughters better than I do and He knows their future. My job is to ask God for guidance to help them along their way. Too often we see having “faith” in something as weak, silly and maybe even childish. I’ve even heard it described as the “lazy way out”. This visual of having a “faith muscle” was an eye opener for me. It takes strength to have faith in God and know that He has His hand on you. Today, set this visual on your heart. Know that it takes strength to set your children in God’s hands and have faith that He will move in them. I hope this visual helps you as much as it has helped me. I truly felt empowered by God to do mighty things!